Stanford Economist John Taylor asks, If government got by with 20% of GDP in 2007, why not in 2021, when GDP will be substantially higher? 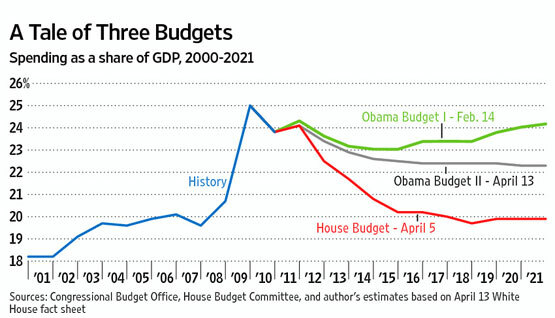 "...For the past decade, the chart shows the recent history of government spending. For the next decade—the window for the current budget—it shows three different spending visions for the future. The uppermost line shows outlays under the official budget submitted by Mr. Obama to Congress on Feb. 14. The lowest line shows the House Budget Resolution submitted by House Budget Committee Chairman Paul Ryan on April 5, while the third line shows year-by-year outlays I estimated from the 12-year totals in the new budget proposed by the president on April 13. The chart clearly reveals a number of important facts that are not coming up in town hall meetings. Most obvious is the huge bulge in spending in the past few years. In 2000 spending was 18.2% of GDP. In 2007 it was 19.6%. But in the three years since 2009 it's jumped to an average of 24.4%. Second, and perhaps even more striking, the chart shows that Mr. Obama, in his budget submitted in February, proposed to make that spending binge permanent. Spending would still be more than 24% of GDP at the end of the budget window in 2021. The administration revealed its preference in the February budget for a much higher level of government spending than the 18.2% of GDP in 2000 or the 19.6% in 2007. Third, the House budget plan proposed by Rep. Paul Ryan (R., Wis.) simply removes that spending binge—it gradually returns spending as a share of GDP back to a level seen only three years ago. When I show people this chart they ask why Washington is even having the debate. They say: If government agencies and programs functioned with 19% to 20% of GDP in 2007, why is it so hard for them to function with that percentage in 2021, when GDP will be substantially higher and with many opportunities for reforms and increased efficiencies? The Democrat party depends on the lazy and shiftless for votes. To guarantee compliance from their base, the Dems like to pour fat union contracts on them and spend gobs of YOUR money on "programs" like welfare and food stamps. The government needs more of your money to spend on strengthening that dependency thus a higher budget to GDP ratio. I guarantee you will NEVER meet a liberal in America who gets this.